I made a card using the girl stamp from the Lemonade Stand Bundle ~ she paired well with the Doodlebug Designs summer line. So bright and Cheery!! 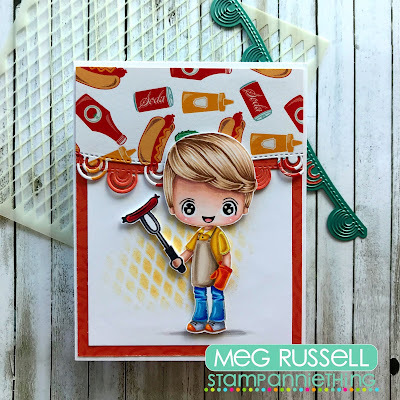 Stacey from Stacey's Creative Corner with you today & I have a fun birthday card to share with you that features some of those awesome Stamp Anniething Stamps and dies. I had a lot of fun making this card! I started out by adding some bright patterned paper to my card base and then using the Card mat dies from Jaded Blossom to add my white card layer. I used Kelly - Happy and colored her with Copic markers & added a little enamel heart to her shirt. I added some balloons from Jaded Blossom and then using the HB2U die from Stamp AnnieThing, I cut out my greeting from some black cardstock and used my white gel pen for a few doodles. I thought it would be fun to add some thread for the balloon strings. Cute right? I finished off the card with a few sequins and some glossy accents for her pony holders. Hi everyone! It's Meg here with you today - grilling out is one of my favorite ways to take advantage of the summer weather. And I love this little guy and the options for him to roast a hot dog, or cook an entire steak or kebab. To create my design, I paired Kevin - Grilling with a couple of the new products from the July release - the Circle Reverse die and the Diamond Ball Cross Hatch stencil. Doesn't this adorable little Kevin just make you wanna grill out yourself?! Go for it...and have fun! Hello! Melissa from Doxie Mel Designs with a new card for you today. To make this card I colored the cutie Krissy Heart Glasses with Copic Markers. The soft waves are created with a newer stencil from Stamp Anniething, Wave Edge. The "sand" at the base of the card is created with Under the Sea Dies. I used stitched oval dies and a large rectangle die from Jaded Blossom. Jaded Blossom's Making Waves is used for the sentiment on the card. Flag Dies 2 for the banners, the Stitched Circle Dies and the Stitched Square Dies for layers. Hi everyone! This is Tina from The Scrappin Rabbit blog and I have card to share featuring the adorable Brittney-Purr stamp. She is another one of my "faves" and I love coloring her and her kitty! First I stamped, embossed and colored her up using Copics. I used plaid patterned papers cut with Jaded Blossom dies to decorate my card base. I added a bow from twine to dress it up a bit and finally stamped and embossed a sentiment from Jaded Blossom's Meow and Forever stamps. I used the Maggie-Steampunk stamp set to create my card. I used the Hello Metal Die to cut out the shape into the card and then layered the cut word into the cut out. I cut the mat for Maggie using the Stitched Circle and Scallop Circle Dies, adding Maggie's head inside like she was peeking out. To finish, I stamped the rest of the sentiment using the Best Friends stamp set and added the banner cut with the Flag Dies 2. Stephen here with another card to share with you. Today I decided to use Trudy - Happy Day. I kept my card clean and simple pulling the colour pallet from the pattern papers I used. I did some simple ink blending using Ripe Persimmon Distress Ink to create the background using the Falling Hearts stencil. Also, there is an awesome sale going on right now in the Stamp AnnieThing online store. All Stamps, Stencils and even dies are one SALE!!!! Now is the time to snap up those awesome Stamp AnnieThing goodies that you have been eyeing up...OH and to make things even more awesome, FREE shipping on ALL orders over $60!! Labels: falling hears stencil , Stephen Kropf , Trudy - Happy Day!